A local man was diagnosed with cancer and then found out he had a genetic disorder. 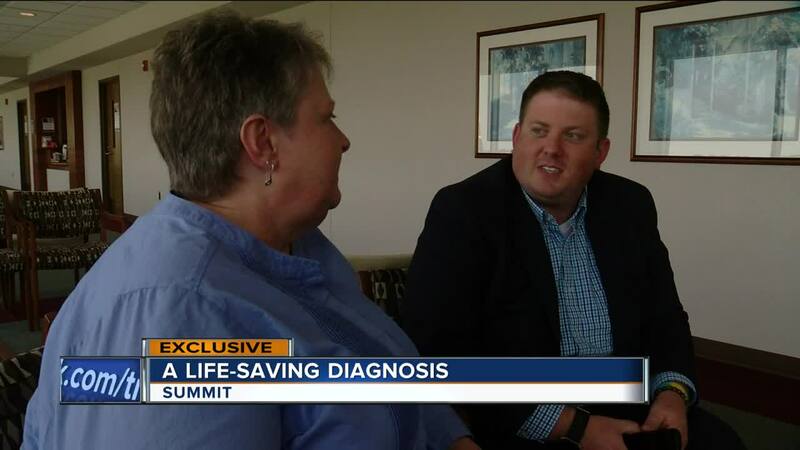 His diagnosis might have ultimately saved his mom's life. Brian Juech found out he had colon cancer around his 30th birthday. "It was scary. It was kind of the worst birthday present," said Brian Juech. The diagnosis was also hard for Juech's mom. "I would have given anything to switch places with him," said Mary Juech. It got worse for Juech. Doctors told him he had Lynch Syndrome, a genetic disorder that makes you more likely to have certain cancers. "Every colon cancer and every endometrial cancer regardless of the patient's age or family history has a screening test to look for the likelihood of an underlying Lynch Syndrome," said Dr. Michael Mullane, Aurora Healthcare. Mullane with Aurora Healthcare said every child, sibling and parent related to someone with Lynch Syndrome has a 50 percent chance of having the disorder. "This is inherited from either mom or dad. A parent doesn't get to pick which genes he or she gives to their children," said Mullane. "I felt almost responsible and I know that's ridiculous because I had no idea, but just knowing it came from my side of the family," said Mary Juech. Brian's mom Mary Juech also had the genetic disorder. "I went for my colonoscopy six years earlier than I would have," said Mary Juech. At that time she was diagnosed with stage two colon cancer. Her son ultimately saved her life. "I look at it as he did save my life because I had no symptoms I was feeling absolutely fine," said Mary Juech. "Just makes me feel like there's a purpose that I was allowed to live through this." "So it turned out to be kind of what I call the reason this all happened. Is because she was able to find out she had colon cancer a lot earlier than I did," said Brian Juech. Brian and Mary Juech shared their story with hopes others will get tested and not ignore signs when your health is changing. Doctors suggest being aware of your family medical history.